The Pajama Pack: I have a little techie bleg. 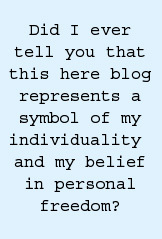 . .
. . .for anyone out there who might be knowledgeable on blog feeds. I've been looking around the web for a way to get my posts from this blog to propagate over to my MySpace blog. This isn't of the utmost importance, or anything. It just seems like it would be a good idea. I'm not all that crazy about MySpace's blog setup, so I don't want to spend a whole lot of time working on it. But, having it sitting there doing nothing just seems like a waste of a decent resource, crappily set up as it may be. Any ideas? I've seen a widget that you can use for it, but it just doesn't appear to be what I'm looking for. I would simply like to have my posts automatically appear over at the other blog, rather than have some widget sitting over at the side all by itself, serving no real function.